John Smeaton's family came from York, where his great grandfather John was a watchmaker and Freeman of the city. His grandfather  also called John  left York for business in Leeds, where he prospered sufficiently to build Austhorpe Lodge on 2.4h near the hamlet of Whitkirk, in 1698. The estate remained the family home and was to became the base for Smeaton's consultancy practice. There is some confusion over Smeaton's birth date  either 28th May or 8th June, 1724. This can be explained by the change England made from the Julian calendar to the Gregorian in 1752, when the date jumped from 2nd to 14th September. Some sources list old-style dates. By our present calendar, Smeaton was born on 8th June and was baptised in Whitkirk church on 22nd. His father William (1684-1749) was a lawyer with a practice in Leeds. William had married Mary Stones, from the hamlet of Beal on the south bank of the River Aire, in 1722. They had three children: John, William (b. 1728) and Hannah (b. 1732). William junior died at the age of 4, and although John was born into a privileged life, he grew up with few friends his own age. His mother taught him at home and he devoted his free time to making working models rather than playing with toys. 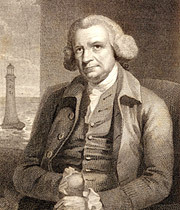 John Smeaton attended Leeds Grammar School between the ages of 10 and 16, and excelled at geometry and arithmetic. He also set up a workshop in an outhouse at Austhorpe and became an accomplished metalsmith and joiner. Although shy with his peers, he was keen to question and observe craftsmen. He once watched the erection of a steam engine for pumping water from a coal mine and then constructed a miniature replica before the real one was working. He used his replica to empty one of Austhorpe's ponds, killing all the fish. By the time he was 18, Smeaton had built his own lathe and used it to cut a perpetual screw in brass, something thought to be invented by Henry Hindley (1701-71) the famous maker of clocks and scientific instruments in York. The two men met in the autumn of 1741 and found that their shared interests and skills generated both friendship and mutual respect, despite the generation gap. Smeaton had been helping in his father's law firm since school, copying legal documents and running errands. William grew concerned that his son's mechanical bent would result in neither an apprenticeship nor an adequate living, so sent John to be educated in the legal profession at London's Gray's Inn in the autumn of 1742. Bored with law, Smeaton returned to Austhorpe in the summer of 1744 and persuaded his father that instrument making should be his career. His time in London hadn't been wasted, though, as he had met members of the Royal Society (Benjamin Wilson, William Watson, Dr Gowin Knight and others) and added astronomy to his list of interests. By 1747, Smeaton was making telescopes, becoming skilled at grinding and polishing lenses. He spent three days a week taking French lessons in Leeds, where he proposed marriage to a Miss Banks. His reluctant parents agreed to the match only if the couple lived in London, whereas her father did not want his daughter so far from home. In a letter to Benjamin Wilson (1721-88), Smeaton says that she lacked fortune, beauty and wit but possessed a sweet nature. Eventually Smeaton withdrew his proposal, and in 1748 he set out for London with financial support from his father to start his business as an instrument maker. Austhorpe Lodge, east of Whitkirk, birthplace of John Smeaton. Built by Smeaton's grandfather in 1698, it was the family home. Young Smeaton set up a workshop in an outhouse at Austhorpe Lodge and became an accomplished metalsmith and joiner. 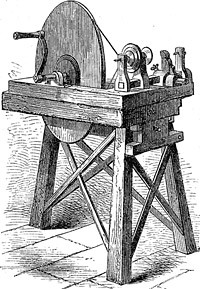 By the time he was 18, he had built his own lathe (pictured) and used it to cut a perpetual screw in brass.